Look closely and you can see the Sofritas on my tacos. If you have read my ABOUT page you will know that there is always that ocassion that arises that you need to grab something quick. I do live in the suburbs, and chains are what’s out here. The only fast food place I will darken the door of is Chipotle. They try to use meat from animals raised without the use of antibiotics or added hormones. They also use local produce whenever they can. I love all that, but the one thing I really appreciate about Chipotle is that it’s always good. I love my beef and their steak is so good and seasoned really well. I also love that they started carrying soft corn tortillas. They just keep making things better. Even for the vegetarians, Chipotle has great options. They have beans and lots of veggies, both grilled and toppings. That didn’t seem like enough options for the vegetarians, so Chipotle added something new. Sofritas. Sofritas are made with shredded organic, non-GMO tofu from Oakland, California’s Hodo Soy, and braised with chipotle chilis, roasted poblanos, and a blend of aromatic spices. 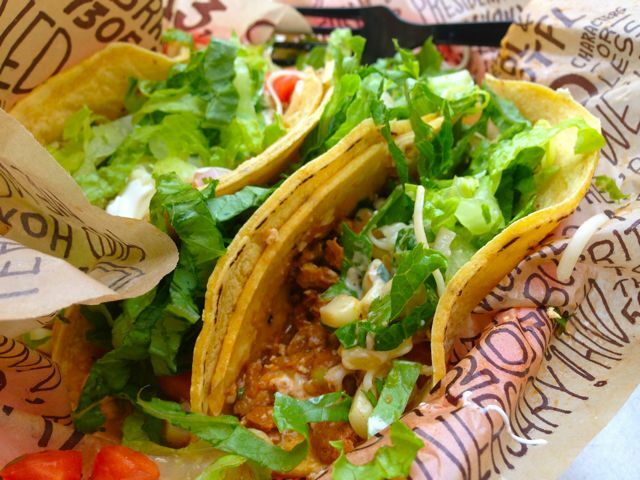 Available in burritos, tacos, burrito bowls, and salads, Chipotle expects Sofritas to appeal to vegetarian and vegan customers, as well as those who are looking for delicious new menu items. We had the opportunity to stop and and try these Sofritas. I have already told you that I love my beef, so not ordering the steak is tough for me. We actually got to sample the Sofritas before we began to assemble the tacos. It tasted very similar to ground beef taco meat that you would make at home with all the seasonings. The texture (tofu is tough for me) was not bad at all. I enjoyed my Sofritas. My daughter ,who likes vegetarian options, loved the Sofritas. They do have great flavor, lots of spices and made a great taco. Nonetheless, whenever I go to Chipotle I will still order the steak, because the vegetarian option is not key to my lifestyle and I just really like the steak. For those vegetarians out there…You are going to love this new option. Disclosure : We did receive a free meal and were asked to blog about it. Since it is a place we do go to on occasion I was excited to be able to try a new product and share my opinion with you. And these opinions are all mine.